Winstep Forums • View topic - So, what's next after v18.8? Post subject: Re: So, what's next after v18.8? some Shelf themes have large margin offsets (i.e. ; the space between the left/right edges of the Shelf - for horizontal Shelves - and where icons start/end). This is not a problem when the theme is applied to a Shelf, but with Drawers it can result in much thicker Drawers than needed. So, there is a possible solution: because Drawers only ever show a single row of icons, they don't use the vertical icon spacing field. By actually making use of this field in Drawers - and especially by allowing it to go negative - we could use it as a way to reduce an overly large margin offset in a specific theme. And as I started looking into implementing this, I was forced to eat a hefty dose of humble pie: in v18.8, the margins of Drawers are actually 20 pixels more than they should be. And this without even beginning to 'eat' at the theme's bitmap margins, which was my original idea above. 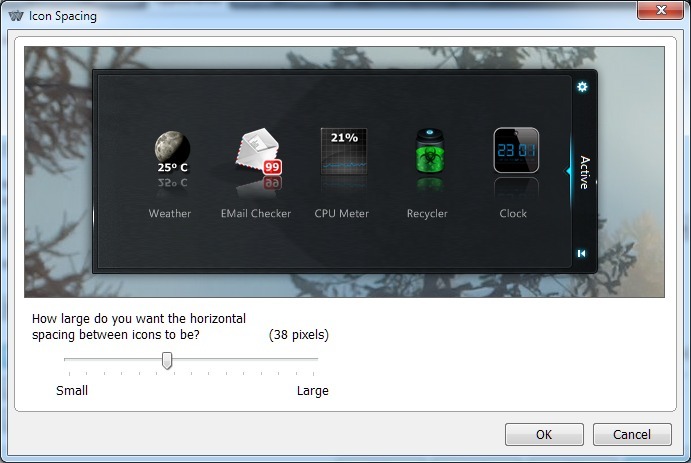 You see, the default vertical icon margin for Shelves (as it appears in the Icon Spacing dialog) is 19 pixels. In the code to render the Shelf/Drawer this value is added to a fixed 20 pixel value (so 20 pixels + user defined vertical icon spacing). What I did not notice because that part of the code was so old, however, is that the *actual* internal value is 19 pixels less than what shows in the Icon Spacing dialog. 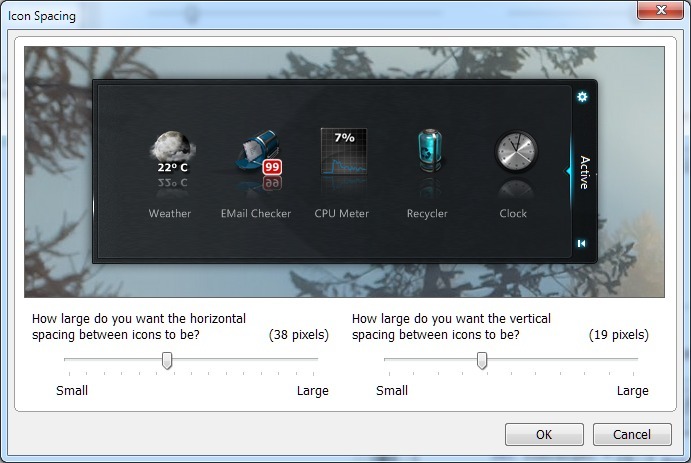 So, if the dialog shows 19 pixels for the vertical icon spacing, internally that value is 0. If you reduce it to 10 pixels, the *internal* value is -9. This number was in turn deducted from that 'fixed' 20 pixels 'buffer zone'. I did not notice that so I thought that simply ignoring the icon vertical space value would do the trick. As a result, Drawers are currently 20 pixels larger than they need to be. So, with the changes I just made, Drawers will already be by default 20 pixels less 'tall' than they are in v18.8 (you can always increase vertical icon spacing to make up for this). 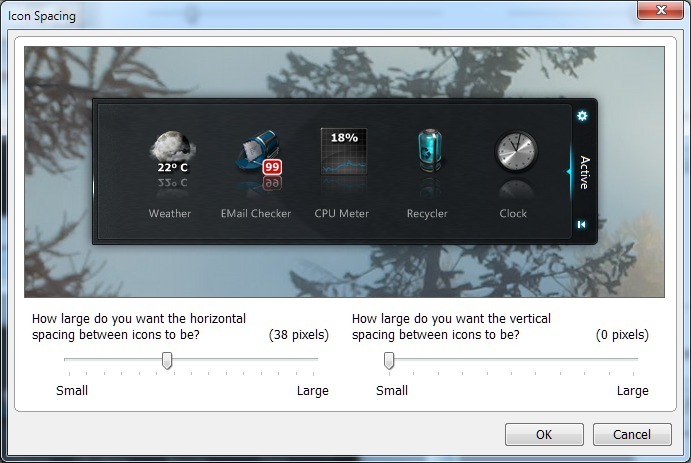 Because I added the icon vertical spacing setting back to Drawers, you can now reduce that size even further (but always within the limits of the theme, there are themes where the margins are already so 'tight' that reducing the vertical icon spacing to a number under 19 pixels will have NO EFFECT whatsoever). Mine looks like the last one. The spacing on mine is minimal. :shock: Mine looks like the last one. The spacing on mine is minimal. Yeah, and what theme are you using for it? Bet it's not DarkTech, or it would look like the first image. There you go. As I said, actual margins depend on the theme. Won't it screw up the margin size on themes that currently have correct spacing if you change it? From the themes I tried here it shouldn't, because it won't go below minimum margin settings no matter what the icon vertical spacing is set to. Anyway, even if an icon spacing of 0 makes some obscure theme look 'odd', all you need to do is increase that same spacing to fix the problem. Something else I would like to add (provided it doesn't imply a lot of work to implement because of other internal dependencies) is an option to left/center/right justify icons in the Shelf. Seems to be a popular request too. This is the type of feature that only makes visual sense, in my opinion, when you have less than a full row of icons. Once you have just as many icons or more icons than will fit in a single row, icon justification stops having any effect, at least for that first row (all the icon 'slots' are filled anyway). Of course, once you overflow a single row of icons you could still center the remaining icons in row 2, but my question to you guys is: would you - or indeed SHOULD you - REALLY do this? It would make my life a lot simpler for various technical reasons if icon justification only has an effect when there are less icons in the Shelf than would fit in a single icon row. Once you get past that point, icons would always be left justified, as it happens now. I think icon centering on the Shelf only makes visual sense (or would only be utilized anyway) when you have less icons in a tab than would fit in a single icon row. After that, it doesn't really matter as the 'intention' of the visual effect is lost (I think). Hope I was able to explain myself well... what do you guys think? How about an answer to my question too, please? A definite and vocal 'No' and 'No' here. To me, the whole thing seems totally superfluous, period. But if it has to be, my vote would be the same as yours Jorge, and it should only apply where there is a single, not filled icon row in a tab or shelf, for that matter. And furthermore, 'centred' is the only option there that would make sense, as 'left' is the default anyway and 'right' doesn't make the slightest bit of sense. Of course, you could go the whole hog and do icon alignment sort of free-form, where you could place icons in any way you like anywhere within available icon spaces. This was how it was, IIRC, in the shelf in the OPENSTEP 4 beta (or it might have been 'The Shelf' app/Fiend.app's shelf). And then why not 'liberate' tiled docks as well and allow icon tiles to be dragged off the dock and placed anywhere on the desktop and fall back into their original place when dragged back to the dock, as with Fiend.app? Centering remaining icons in a row would just cause confusion. It would be like me typing this sentence, and then instead of hitting the Enter/Return button and keep typing, I would then hit the Tab button and center the few words left in the sentence. So, this is in accordance with why it's natural to have the icons start alphabetically at the top left and move to the right even though the Shelf is inverted and docked at the top. You could however make it an option if for some reason someone wants to do that, but by no means should centering remaining icons be the default. Ok, thanks. Guess we all agree on this one then.